Incontinence products for women are a great way for women with any degree of incontinence to manage their symptoms while seeking treatment options to stop or lessen their incontinence. Knowing what is available can help women feel confident in their protection, and not let incontinence get in the way of living their life. As many as 40% of women with incontinence say that it interferes with their life, meaning social, professional, and otherwise. Incontinence products designed for women can help reduce that number, and allow women to manage their incontinence while still going about their other activities. Underwear: Incontinence underwear for women are often referred to as pull on products, as they pull on and off like regular underwear. However, there are adjustable options as well. They are a great option for the women who needs absorbency and discretion, as they often appear to be traditional underwear, with a soft, stretchy, and cloth-like material that mimics real underwear, but offer an absorbent core, an odor neutralizer, and more. 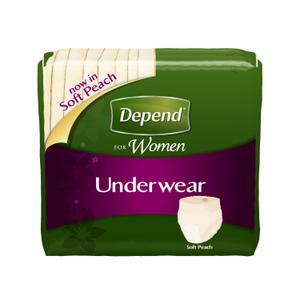 Learn more about great options for incontinence underwear for women. Silhouette- Depend has created an awesome line of pull on underwear for women, called the Silhouette. These underwear are ultra absorbent, offering protection while mimicking the look and feel of traditional underwear. They are designed to have a very low side profile, to make them extremely discrete, and easy to hide beneath clothes. They are designed specifically for a woman’s anatomy, which reduces leaks, and provides superior protection. Pads: Another option that many women find very comfortable to use is that of incontinence pads. They are much like a pad used for menstruation, but with greater absorbency, making them ideal for those with light to moderate incontinence, that need a little extra protection during the day. They are inserted in underwear, and usually have an adhesive strip to help keep them in place. They can be worn with real underwear, or in addition to other incontinence products for added protection. Within each category are a number of different brands and sizes. In order to avoid costly mistakes in selecting the right incontinence products for women, consider ordering samples. The CareGiver Partnership offers 100 different samples. Or consult and expert. Their knowledgeable product specialists can help you find the best size and products. These nice ladies will help you find the perfect fit, or help you order the samples that might best service your needs. To contact a product specialist call 800-985-1353 M-F 9-4 Central.